Each client who walks into your agency dreams of their future family. Most of your clients come to you because they know about adopting domestically, internationally or through the foster care system. They may come with a specific form of adoption in mind because they are hoping to build their family through adopting an infant, an older child, or a child from a specific ethnic background. This is your opportunity to demonstrate that you are their trusted source for information on all of their family building choices by sharing with them an option they may not be familiar with: Embryo Adoption. As the newest form of adoption, embryo adoption may feel like unfamiliar territory. Perhaps you are considering sharing embryo adoption with your clients but feel you are not prepared to answer your clients' questions. 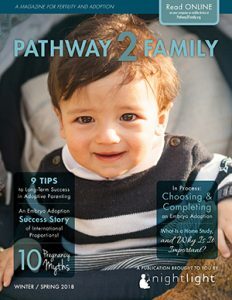 The Embryo Adoption Awareness Center is here to help you grow in sharing embryo adoption confidently with our various resources, including brochures, webinars, educational videos, extensive FAQs and even a customizable power point presentation on embryo adoption, which you can receive by emailing our adoption agency liaison. Perhaps you are concerned that since your agency only offers domestic, international or foster adoption services that you could end up losing clients or revenue if you start sharing embryo adoption. Embryo adoption simply is not the right choice for everyone. Domestic, international and foster care adoptions are still great options for many clients. However, many adopters are still yearning for the opportunity to experience pregnancy. Your client base may actually expand should you chose to share embryo adoption as an alternative and offer embryo adoption home study services to your existing programs. In doing so, you remain the clients' local adoption expert for future services, which means your revenue base may actually grow. For some clients, this motivation is infertility. Do your clients still want to experience a pregnancy? Embryo Adoption allows the couple to experience the excitement, joys and trials of pregnancy and childbirth. This is the highest motivating factor for many individuals. Some couples may come to adoption because they do not feel comfortable with the idea of egg or sperm donation and the subsequent unequal genetic connection. Embryo Adoption provides an equal genetic connection to the child - none! Families who simply enjoy the pregnancy experience and have an interest in giving remaining embryos an opportunity to live may also be natural candidates for embryo adoption. Some clients may arrive at domestic adoption because they desire to help a woman in a crisis situation. Your client may desire to adopt an infant but be concerned about race, prenatal care, or may be difficult to match. Embryo adoption may be a great solution, provided that your clients may be able to carry a pregnancy and wish to do so. Some clients have a philosophical preference for parenting an orphaned child and may be considering international adoption. If they desire to adopt a very young infant, may find travel time and expenses a burden, or do not easily meet the requirements of destination country it may be appropriate to suggest embryo adoption as an alternative. There are currently over 600,000 frozen human embryos in storage in the United States and the number embryos in frozen storage increases by about 5% every year. A certain percentage of these remaining embryos will be donated to another couple. There are embryos available NOW for waiting families. The embryos are also without families. Embryos can wait for over two years for an adopting family. There are more embryos waiting to be adopted than families available adopt them. Due to high storage fees and the emotional toll of having embryos in storage some families give up and discard them if they are not adopted in a reasonable time frame. When Should We Share Embryo Adoption with Our Clients? Domestic and international adoptions are becoming increasingly difficult. Fortunately there are many points in time where an agency has the opportunity to educate their clients about another adoption choice. During your initial consultation with clients about adoption, you can present all their options to them so that they can make an educated decision of what option will be best for their family. Their home study social worker may also find as they are conducting the family assessment that they are a good candidate for embryo adoption and choose to share that option with them. In the event that their adoption experiences a disruption, embryo adoption is something that can be brought up again. As we all learned in psychology 101, a person truly grasps a new concept after being exposed to it five, six, even seven or more times! By continuing to share embryo adoption with your clients, they may find the path to their desired family in a more timely and cost effective manner. It's important to help your clients face their fears and discover the advantages (and disadvantages) of embryo adoption. Discover the answers to common questions so you will be prepared and feel confident in answering your clients' questions. How can we educate our clients about embryo adoption? Choosing to share embryo adoption with your clients may be as simple as adding a section to your agency's existing website. Adding links to websites with information on embryo adoption to your resources page may be a great place to begin. You may also choose to include brochures on embryo adoption in your information packages that provide information on all your clients' options. The Awareness Center has also created a customizable power point to make sharing embryo adoption confidently easily in your grasp. Simply educating your clients regarding this unique adoption choice does not preclude your agency from participating in the process. Your agency could still offer to perform the required home study. Perhaps you could partner with an existing embryo adoption agency and refer clients to their program... similar to an international adoption referral. Why would a client choose to work with an adoption agency for this when they could simply work with a fertility clinic? Clinics are selective about embryos they will accept, making the waiting list to receive embryos long. This is because clinics are focused almost exclusively on assisting patients achieve a successful pregnancy, meaning they are focused on the short-term success not on long-term emotional wellness. Most clinic embryo donation programs are anonymous, but research indicates that embryo donors would prefer to have some say in who receives their embryos and perhaps be able to have contact with the adoptive family. The ability to have a directed donation or open adoption relationship with the adoptive family makes donating embryos through an agency embryo adoption program more attractive to some donors. Embryo adoption agencies, therefore, tend to have embryos waiting for adoption, rather than adoptive families waiting for embryos. Embryo adoption through an agency, however, is child-centered, applying all the great lessons we have learned from Adoption Best Practices to the process of embryo donation. Embryo adoption incorporates counseling - before, during and after the adoption process. Full disclosure regarding genetic siblings is encouraged. The home study process helps ensure the parents are prepared to raise a child who is not genetically connected to them. The home study also ensures the child is placed in a stable loving home, providing peace of mind for the donors.